You can enter the recipient of an e-mail in more than one way. Use your keyboard to enter it manually or use your Contacts. Type the name or e-mail address of the recipient into the To field. mail.com automatically suggests entries from your Contacts and unsaved contacts from the past 90 days. Click to select the appropriate recipient. 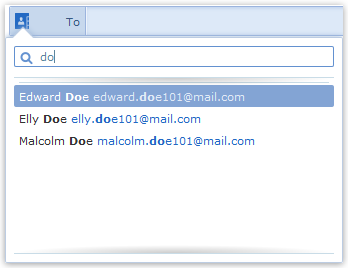 Click the Contacts icon to the left of the recipient field. A list of entries from your Contacts and your unsaved contacts from the past 90 days will appear. Use the search function to narrow down the selection. Click to select the appropriate recipient.